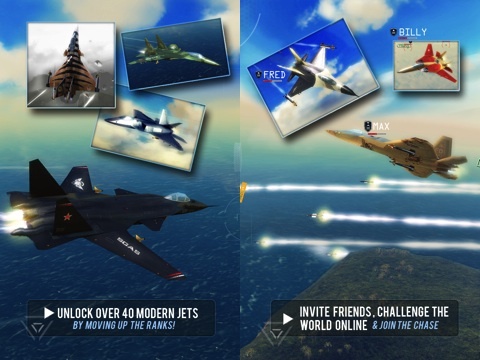 We played Sky Gamblers: Air Supremacy from Namco Networks America, Inc. on an iPhone 4S for this review, although the app runs and looks amazing on the New iPad as well. In summary, this app is definitely worth its price tag and will appeal to iPhone and iPad gamers who enjoy physics based control shooters. Read for our full review game details below. The story behind Sky Gamblers isn’t really the point, but the way in which it is told is pretty interesting. We get snippets of information about your fighter pilot squadron through artfully drawn comic sequences. The storytelling style is similar, but inferior, to Max Payne type games, with temporal jumps and plenty of opportunity for imaginative leaps. Basically, you are a fighter pilot who loses his squadron under strange circumstances, then joins up with a group of mercenaries. The story is probably the weakest part of Sky Gamblers, but it almost doesn’t matter, because the gameplay and graphics are just so damn good. 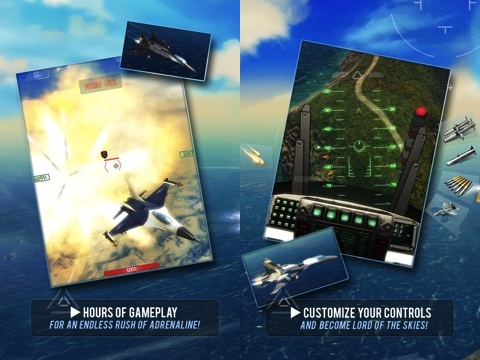 Sky Gamblers is perhaps the first exciting fighter jet simulator on the iPad and related devices. While there have been others, none provides nearly the same edge-of-your-seat excitement that Sky Gamblers does. The game’s controls take some getting used to, as they involve both tilting the mobile device and swiping the screen to perform aerobatic tricks and bombing runs. Once I got good at it, however, it was exhilarating. I got dizzy after awhile, tilting and jolting my phone while staring intently at my fighter jet, so be sure to take a break after a bit. There are several different missions you can engage in throughout the Sky Gamblers campaign, including dogfights, ground strafes, bombing runs and formation maneuvers, as well as various combinations of these. This keeps the gameplay interesting and made me wonder what was coming next. I got some strange glances on the bus while engaging other pilots in dogfights, so this is maybe not the iPhone app for public play. If you enjoy tablet and mobile gameplay at home, however, this game’s fast-paced controls will require your full attention. While the audio in this app is relatively average soundtrack that merely complements the game rather than adding to it, the graphics are nothing short of incredible. They are the quality of a current generation console or PC application. Ducking and weaving between buildings, shooting missiles and watching your plane explode in a million perfectly rendered bits is extremely immersive, if you enjoy fast-paced gameplay. It is well worth the $5 payment. I would recommend that you use a high-powered device such as the iPad 3 to enjoy this game rather than one of the lesser iPod Touch or other such machines, as the graphics might cause these to lag. Furthermore, this is much more for tablets than for phones. I played on my iPhone, and while it was still fun, I couldn’t help but think that I was missing out. A tablet would really showcase the game’s high-quality graphics on a bigger screen. This app is incredible. Namco really succeeded at taking mobile flight simulator to the next level. It is an experience of whole-body gaming, really bringing out the possibilities inherent in mobile simulator application games. While I just skipped through the storyline in order to get to the flying, there was enough variation in gameplay to stay interested for hours. AppSafari review of Sky Gamblers: Air Supremacy was written by Darius Reimm on April 3rd, 2012 and categorized under Action, App Store, Featured, Games, iPad apps, Physics Based, Universal. Page viewed 5090 times, 1 so far today. Need help on using these apps? Please read the Help Page.